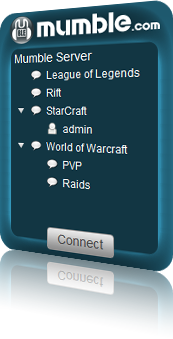 The Mumble server status tool provides a live view of your server's channels and users. Enter the URL to the JSON encoded Channel Viewer Protocol provided by your Mumble host. This is not the URL you use to connect to your Mumble server. The URL to your Channel View Protocol is a seperate URL used specifically to provide a JSON or XML encoded view of your Mumble server. Note that not all Mumble hosts provide this feature. If you have a Mumble server from Mumble.com, the URL to your Channel Viewer Protocol is located in your control pannel.